Let's revisit this special event, shall we? 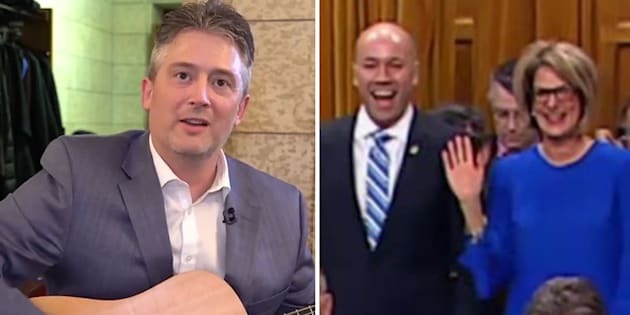 The overnight voting marathon in Parliament went on so long that Conservative MP Blaine Calkins, left, had enough time to write a song about it. UPDATE: Since this episode was shot, Conservative Leader Andrew Scheer has agreed to accept the Liberal government's offer of a security briefing on the Jaspal Atwal affair. It's a time for rejuvenation! For hope! And in Parliament's case, for political stunts that cost thousands upon thousands of dollars! Federal MPs kicked off the first few days of the season with an overnight vote-a-thon that — you guessed it — accomplished very little. It all began when the Conservatives insisted that the Liberals allow Daniel Jean, Prime Minister Justin Trudeau's national security adviser, to testify at committee about his boss' trip to India. The visit quickly became controversial after CBC News revealed convicted attempted murderer was invited to two events for Trudeau. The Liberals didn't give in to the Tories' demands, of course. In retaliation, Tories sparked a 21-hour democratic brouhaha. On the third episode of "Backbenchers," we take a look at a rarely used Parliamentary tactic, show how some MPs coped with the overnight voting session, and discover our deeply hidden acting talents. Watch the full video embedded above. Catch "Backbenchers" every other Tuesday, right here on HuffPost Canada.